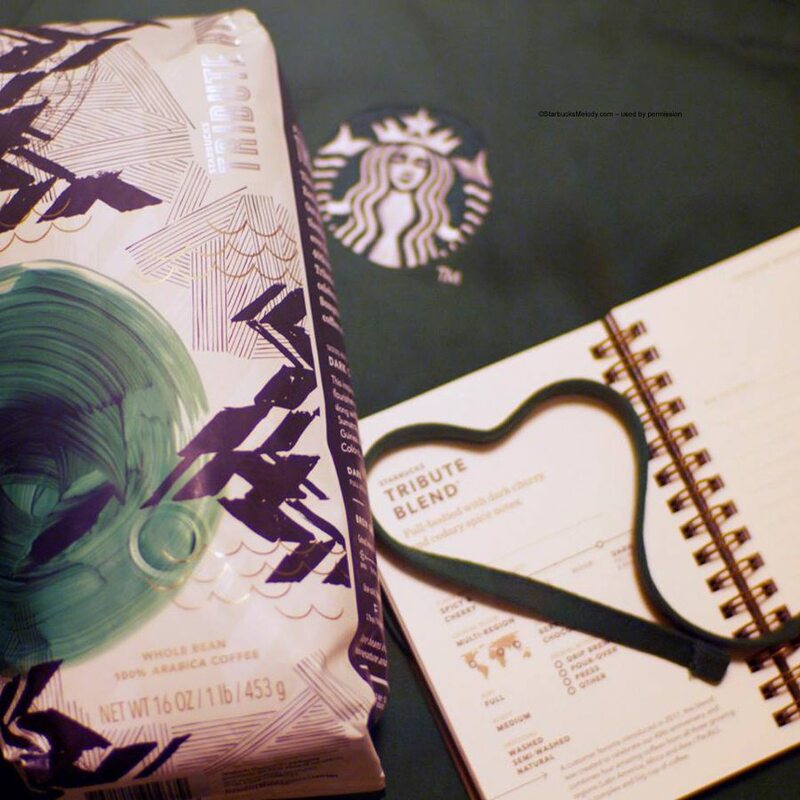 Starbucks Tribute Blend Returns on March 4, 2014. I am looking forward to this coffee. It’s a favorite of mine with its bold and complex flavors that include a little bit of spiciness from Aged Sumatra. Stock up on it while you can. My understanding is that this year Tribute Blend will be offered as a whole bean coffee, as well as Verismo pod format, Via Ready Brew, and K-Cup format. The bag has undergone a major re-design this year. I must admit, I’m still getting used to it! Keep your eye out for this Starbucks favorite! NEW: Panama Geisha Reserve in 972 Numbered Bags Available Beginning Thursday. That’s a very bold redesign! I’m looking forward to trying this year’s blend very much. Looking forward to tasting this year’s Tribute Blend! The package re-design certainly is a bold change; I must admit I kinda liked the simplicity of the old Tribute Blend packaging, but the new design looks interesting. As always, I’m sure the taste will be off the charts! One of my favorites. The new bag is eye catching and maybe even more people will notice it and give it a try. It reminds me of the Kati Kati bag in a way, just not as busy. I’m so glad Starbucks has gone in this direction of making the bags exciting again. @Chris – I like the way you call it a “bold redesign” So true! @BeckyE – I have heard a number of people compare this to Kati Kati. It’s fun but I’m not convinced it’s enduring. The bag designs that had really long term enduring images that people thought of (“The Verona Bridge”) were some of the best I think. But this might serve it’s purpose of making the coffee really stand out from all the core coffees! Melody, where can I find one of these Starbucks passports? @John – Those passports were really designed for partners only. I recall this past December there was some kind of Starbucks tasting kit being sold as a holiday gift item – it came with 2 bags of coffee, a press, and it had one of those passports in it, and retailed for like $30. I didn’t buy it but thought that’s the only time I’ve ever seen one of those passports available to customers, and it made the tasting kit really valuable. There’s an older green version of the passport that’s being phased out by stores. It might easier to get a store to give you one of those because they kind of need to get rid of those. I’m in deep debt to a downtown Seattle store manager who held onto a passport for me. The image above was staged by a partner and shows her passport. I was trying to work on the partners for a sample of this earlier in the week since they have all sampled it themselves, and I happened to notice the bag by the Clover. I used to have good luck with doing so, but as veteran Partners leave, the newer ones are not so eager to do so. For me, this is just another reason to be bummed with Starbucks stores as of late. I’m actually looking forward to trying the new Sumatra Blue Batak Reserve coming out Tuesday. You’re a lucky gal, Melody! @Chgo: they’re not supposed to sample seasonal or new coffees before their promo date except themselves and other partners to have advance time to be knowledgeable about the flavor and to make a sweeping generalization about newer partners because they are doing their job is really disrespectful. I’m glad you’re excited for the coffee but you can wait to have a sample and count down with everyone else. They’ll be more than happy to sample it when it reaches its actual street date. @Kiwisoup – I get that you’re trying to follow some strict rules. But that’s so not in keeping with what Starbucks history is or the Starbucks experience. While you can’t buy a new coffee or promo beverage early, I see sampling happening. That creates buzz and excitement. I think sometimes when customers say “Veteran partners” (though I can’t speak for Chgo!) they mean familiar faces they’ve seen over and over again. And it’s true that often partners treat their regulars whom they see often different than they treat new faces to them. But also there’s this whole idea of “empowering” partners to deliver the Starbucks experience. That usually means being comfortable just saying “yes” to random things – even if it means sampling. And then this cycles back to something I’ve said over and over and over on this blog, the only way that partners EVER learn to say yes is if they know there won’t be backlash from a store manager or district manager. I haven’t asked for a sample of Tribute Blend yet. I am still in love with the Yirgacheffe on the Clover. hey melody, have you gotten any neat mail recently? i, personally, am not a big fan of the new packaging, but it will definitely stick out in a crowd. i liked the sleek design it’s had the past couple years. chiming in as a former barista, we really weren’t supposed to open product early, but we were always encouraged to make a customer into a happy customer in whatever ways we legitimately could, so i could see my crew having busted open a bag for early sampling if someone asked. 2) totally agree w/ Chgo and @ Melody about the ‘extra’ actions of partners at Sbux! If it wasn’t for the great partners, sms, dms, rdms, rvp, etc……I would feel very disenchanted with Sbux these days! (even thankful to Cecile, MSI!! !…all the extra miles….) Back in the day (@DadC….. 😉 we didn’t need anything ‘extra’. Sbux was just a real COFFEE house. great coffee, few good pastries and some fun merchandise/coffeeware. not so much anymore! it’s the little things, it’s the BIG things, it’s all the ‘just say yes’ things! I give all I can of my $$$ and kindness to Sbux and all the great partners. Do I expect special treatment? yeah, actually, a little bit….I think I do. As long as it’s not slighting anyone else and I do truly give all I can and also appreciate (and am truthful>>>> BOO! on PPR) it, yeah, I’m ok with this ‘rule-bending’. Speaking of Yergacheffe……OMG, soooooo good on Clover, I first had that as a partner- kindness way back in late ’96 or ’97 when a partner made a press of it for my friend and I sitting in our little local Sbux (long before Black Label or Reserve). He thought we might like it……we all know where that lead! Another seasonal that I always look forward to. Oh, how I agree with @Chgo and @denise r, thumbs and toes up. i love the new look for tribute this year!!! it does remind me of the kati kati bag design. i hope that starbucks will post the inspiration behind this artwork. i have been really sick, so i haven’t opened and sampled tribute yet. oddly enough, no one at my store has either. i have a shift meeting tomorrow, so i might suggest opening a bag to sample then to get the ball rolling. Gah, I don’t know about that new bag design. A little unsettling for my taste for some reason; seems like there is no clear focal point for this design, but maybe it’ll grow on me. Tribute Blend was the very first coffee bean that I bought for myself to brew coffee at my own home and that’s the coffee that got me obsessed with coffee in general… I love how it tastes iced. I’m excited for its release! @kiwisoup – Your opinion couldn’t be any further from the truth. Rude? Hardly… Partners love me! I’m Mr. Charm and Charisma! This has never been a problem in the past, regardless how they do things elsewhere. I’m speaking out of personal experience. I mean no disrespect, but I don’t see why this would be a problem for you or anybody for that matter? It don’t feel that I’m getting special attention, considering the samples are generally shared with others. There should be more sampling going on, and not less. You are free to disagree. My guess is that most people might side with me. Who wouldn’t? For what my family spends on Reserves on a Clover in a month, I don’t think it hurts to ask. And if I’m bummed by the answer, I’m not hurting anybody but myself. Just my 2¢. @Chgo, @denise r, and @kiwisoup – up until about 6 months ago, a group of morning regulars and I were always included in the “Partner” tastings of new products. The Store Manager was interested in our opinions. The script that was sent along with the new products was also tested on us. Several times we were able to point out some misses in the script that would help with the “sales pitch” and sometimes we were able to point out some BS. Businesses need REAL customer input. Not from some fan that feels the business can do no wrong. Only with true objective and informed opinions can a business really improve. @DadCooks – My sentiment exactly. However…. If kiwisoup wants to disagree on something we see as valuable to Starbucks, that’s kiwi’s business. I’m not interested in changing anybody’s mind, nor will kiwi change mine. Maybe kiwi doesn’t see this as normal for some of us who have had the experience in the past. I think kiwi had more of a problem with labeling partners as veteran’s or not. I think kiwi is misinterpreting what I meant, but that’s fine by me. What matters is what I really meant, and that is something between me and the partners I have come to know. I can’t help that some of the newer partners are less informed, but that doesn’t mean that every veteran is equally if not more qualified. Each partner is judged individually. @Chgo – Thanks for reminding me to be a bit more diplomatic. Yes, @kiwisoup and all other low information consumers do have a right to express their opinions. I may seem stuck on some opinions, but that is only because not enough evidence has been presented to justify a change. And I will admit too, that as I get older it takes a lot more to change over 60 years of experience. I think of you and @denise r with every weather report I see or hear. I am so glad that the harsh Chicago winters are just a not-so-fond memory. Take care compadres. @DadCooks – Always be yourself. If there was ever a time you didn’t agree with me, feel free. Don’t hold back! I would respect your honesty whether I agree with you or not. Right about now, I would love to send some of this water that is snow out west. We have had 2 days of major melting, and alot of rain on the way tomorrow. The ground is frozen, and it all equates to possibly 5″ of water with no ground to absorb it. Hopefully the severe weather will stay south. I’m keeping my fingers crossed. Its been a long tiring winter. I think even Denise has grown snow weary. All I know is there are many people out west that would call our curse, their blessing. @chgo: ha! actually, I am a LITTLE 🙁 weary of it…like I think we said once before: if it could only have been either 25 below zero OR snow after snow after snow…..maybe not so bad but with both, at least every other day……yeah, too much. Plus, I am about to be the caregiver of a dear fiend who is having a 2 part total-ankle replacement next week. The first part alone is 6 wks of absolutely NO wt bearing so….. I think if it wasn’t for that anxiety added to this, I might feel a little better re: our weather. Just too hard to get around. is 2/27. can use all the mental support or advice I can get…. Now, on another note but exciting and Sbux, our first Mt Prospect store (’96) has moved and is opening today a block away from where it was (not as a drive thru!) and with a Clover!!!!! So, am about to go there…..am expecting it to be pretty busy…..unless some of this pouring sleet etc might keep some people in. Congrats on the Clover Denise. Now if only DadCooks could get one. FYI Denise. I shattered my ankle in 9 places and dislocated it ar work in 99. It was one of the worst damage my surgeon ever fixed. Some day I may need an ankle replacement, and I dread the thought of it. It us very uncommon and I only heard of one such surgery in the newspaper after my surgery. The recipient was a WWII Paratrooper. Not to take sides, but technically there is a sampling calendar that every store is expected to follow. It always tells us what coffee, espresso beverage, and pastry to sample each week. Currently it tells us to sample Casi Cielo as it’s the current promotional/seasonal coffee, not Tribute. One of the hardest things about being a partner is having a big thick book of standards and policies, and then having something like “just say yes” which basically means take that big book and toss it out the window. I, as a partner, know that I can comfortably break policies and not get in trouble if it was to make a customer happy, but even though I have time and time again, I still feel like I’m “breaking the rules” and wonder why they are even there in the first place. I can see both sides here but I find the backlash against kiwisoup really unnecessary and distasteful as they are they are technically right. This thread just got a little juvenile the further down I got. @Mb – Who is to say that person is technically right? Frankly I don’t think in downtown Seattle that would be the right answer. If there’s a bag of open Tribute Blend near the Clover, and a customer asks for a sample, I’m sure the answer would be yes. Starbucks needs to get away from everything being a rule and remember what they built their name on. It used to be that it was the norm to share coffee with customers by sampling. It’s weird that something that used to be the norm is now considered breaking a rule. All I know is that there are both customers and partners with a real passion for coffee and sample of coffee is a great way to connect.